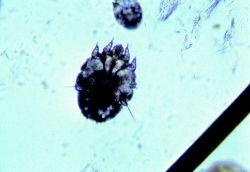 a widely distributed genus of mites, including the species S. scabie´i, the itch mite, the cause of scabies in man; different varieties of the organism cause mange in different animals. /Sar·cop·tes/ (sahr-kop´tēz) a genus of mites, including S. scabie´i, the cause of scabies in humans. A genus of Acarina that includes the mites that infest humans and animals. 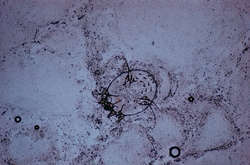 Sarcoptes scabiei causes scabies in humans. 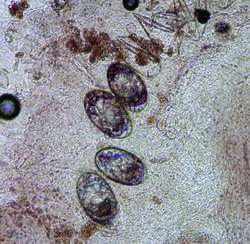 a widely distributed genus of mites in the family Sarcoptidae which causes sarcoptic mange. Their nomenclature is confused but the most widely used system of nomenclature is Sarcoptes scabiei var. canis, var. suis, var. equi, var. ovis, var. bovis, etc. Extracts of Sarcoptes scabiei De Geer downmodulate secretion of IL-8 by skin keratinocytes and fibroblasts and of GM-CSF by fibroblasts in the presence of proinflammatory cytokines. Our study was designed to compare the susceptibility of Sarcoptes scabiei mite to 5% permethrin and 1% ivermectin. In the present study, epidemiological data on Sarcoptic mange due to Sarcoptes scabiei var cameli was collected from various rain fed and arid areas of Punjab province of Pakistan. DISCUSSION: Human scabies is a contagious cutaneous infestation caused by the ectoparasite Sarcoptes scabiei var. O raspado de pele revelou a presenca de acaros Sarcoptes sp. Sarcoptes scabiei (27/10/2006) Nombre de un parasito que causa irritacion en la piel. OConnor explained that the mite responsible for the extreme hair loss seen in "chupacabras syndrome" is Sarcoptes scabiei, which also causes the itchy rash known as scabies in people. Typically, the scabies mite, called Sarcoptes scabiei, causes an itchy rash often between the fingers which is treatable with a lotion. Skabiyes, Sarcoptes scabiei hominis'in neden oldugu bir deri infestasyonudur. A Scabies is an itchy skin condition caused by a tiny human parasite called sarcoptes. Incluem-se aqui as entamoebas, os flagelados intestinais, o Enterobius, o sarcoptes da sarna, etc.